Valvoline is offering even more protection for your vehicle! 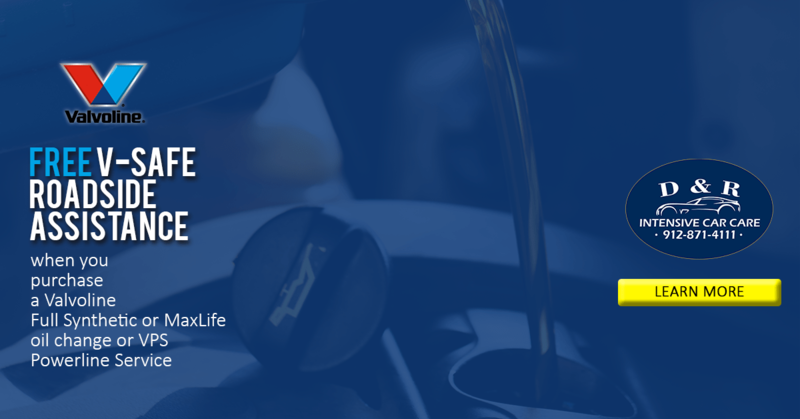 Get FREE V_SAFE ROADSIDE ASSISTANCE when you purchase a Valvoline Full Synthetic or MaxLife oil change, or VPS Powerline Service at D & R Intensive Car Care between February 1st, 2017 – December 31st, 2017. 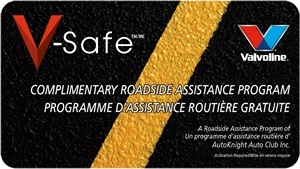 Coverage for emergency road service throughout the United States and Canada. Emergency towing service at no out-of-pocket cost for any tow up to 15 miles. Greater than 15 miles is available at customer’s expense. A service truck will deliver emergency supplies of gasoline, water, oil, or other necessary fluids. Customer pays only for the cost of the supplies at the time service is rendered. Jump Start or boost a dead or weakened battery. If keys are locked inside registered vehicle, customers will be assisted in gaining entry to the vehicle’s passenger compartment only. Locksmith services may be dispatched as needed at customer’s expense for labor and key making. So be sure to schedule your next Valvoline Full Synthetic or MaxLife Oil Change, or VPS Powerline Service online today, and let D & R Car Care help you get back on the road, FAST! Limits apply. Coverage provideded by Nation Safe Drivers. See myvalvolineaccount.com for additional terms and conditions. Please note – this service is ONLY available with purchase of a Valvoline Premim Oil Change OR VPS Powerline Service at eligible/participating locations between 2/1/2017 – 12/31/2017. Not available with purchases at Valvoline Instant Oil Change locations. You must submit your request online at myvalvolineaccount.com before 1/31/2018. See store for additional details.